New Jurassic Park Themed Ride Coming to Universal Studios Japan? A couple months ago Screamscape reported that Universal Studios Japan will open a new coaster style ride in the Jurassic Park section of the park. Now Instagram user shichan14 has posted a photo from Universal Japan of construction walls with the words “The Greatest Dinosaur Ride in the World, Coming in 2016!” I’m not sure if this will be the roller coaster Screamscape mentioned or something else entirely. They already have the River Adventure, so it can’t be that. And I do notice there is a pteranodon pictured on the wall in question. Read more below. 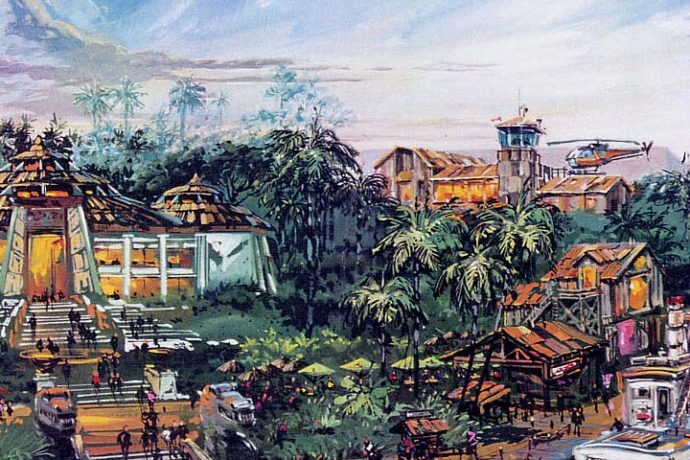 When Islands of Adventure was still in the planning stages, there were plans for two attractions in Jurassic Park that never got off the ground. One was a helicopter tour simulator ride that would take you around the island but then be attacked by pteranodons. Another ride concept was a flying coaster, similar to the Manta now open at SeaWorld, that would let you feel like you were a flying pterosaur, soaring through the air. And it would take place inside the Aviary at Jurassic Park, where the Pteranodons presumably would live. Animatronic flying reptiles would be there and even have a few close calls with your coaster vehicle. The originally planned helicopter tours building can be seen in this early concept art for IOA, where Hogwarts Castle now resides. Could one of these ideas finally see the light of day in Japan? These attractions were likely going to be built in Islands of Adventure on land now occupied by the Hogwarts Castle and the upcoming Kong attraction. With the pteranodons featured so prominently in the new Jurassic World film, now’s a great time to resurrect one of these concepts. We know something is coming to Japan, and when Universal says it’s going to be the best dinosaur ride in the world, I tend to believe them. I mean, they have been sticking to their word lately. An official announcement has not yet been made. More news to come as it happens, so stay tuned. Its like the Manta roller coaster. Saw the tracks the other day!